Infection-prevention procedures are simple, effective, and inexpensive. Germs (infectious organisms) of concern in the clinic include bacteria (such as staphylococcus), viruses (particularly HIV and hepatitis B), fungi, and parasites. In the clinic infectious organisms can be found in blood, body fluids with visible blood, and tissue. (Feces, nasal secretions, saliva, sputum, sweat, tears, urine, and vomit are not considered potentially infectious unless they contain blood.) The organisms can be passed through mucous membranes or broken skin, such as cuts and scratches, and by needle sticks with used needles and other puncture wounds. Infectious organisms can pass from clinics to communities when waste disposal is not proper or staff members do not wash their hands properly before leaving the clinic. These rules apply the universal precautions for infection prevention to the family planning clinic. Hand washing may be the single most important infection-prevention procedure. taking off gloves, and whenever hands get dirty. 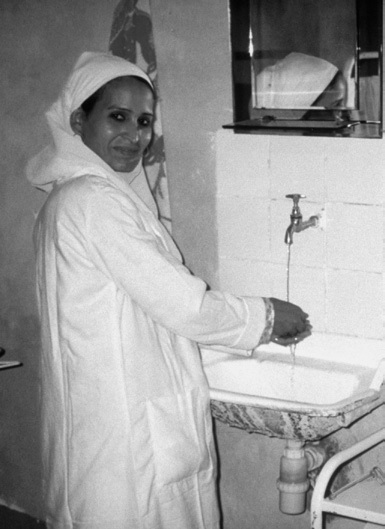 Wash hands when you arrive at work, after you use the toilet or latrine, and when you leave work. Dry hands with a paper towel or a clean, dry cloth towel that no one else uses, or air-dry. eliminate all types of germs and might not remove harmful chemicals. High-level disinfect or sterilize instruments that touch intact mucous membranes or broken skin. the skin(see The 4 Steps of Processing Equipment). Wear gloves for any procedure that risks touching blood, other body fluids, mucous membranes, broken skin, soiled items, dirty surfaces, or waste. membranes or generally to avoid exposure to body fluids. Gloves are not necessary for giving injections. Change gloves between procedures on the same client and between clients. Do not touch clean equipment or surfaces with dirty gloves or bare hands. Wash hands before putting on gloves. Do not wash gloved hands instead of changing gloves. Gloves are not a substitute for hand washing. Wear clean utility gloves when cleaning soiled instruments and equipment, handling waste, and cleaning blood or body fluid spills. Pelvic examinations are not needed for most family planning methods—only for female sterilization, the IUD, diaphragm, and cervical cap (see Importance of Selected Procedures for Providing Family Planning Methods). Pelvic examinations should be done only when there is a reason—such as suspicion of sexually transmitted infections, when the examination could help with diagnosis or treatment. considered only when single-use injection equipment is not available and the program can document the quality of sterilization. with an antiseptic has no added benefit. Wipe examination tables, bench tops, and other surfaces that come in contact with unbroken skin with 0.5% chlorine solution after each client. Use personal protective equipment—goggles, mask, apron, and closed protective shoes— when handling wastes. they are put into the puncture-proof container.) 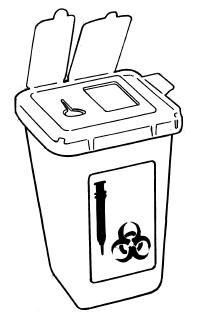 The puncture-proof sharps container should be sealed and either burned, incinerated, or deeply buried when three-fourths full. Dressings and other soiled solid waste should be collected in plastic bags and, within 2 days, burned and buried in a deep pit. Liquid wastes should be poured down a utility sink drain or a flushable toilet, or poured into a deep pit and buried. Clean waste containers with detergent and rinse with water. Remove utility gloves and clean them whenever they are dirty and at least once every day. Wash hands before and after disposing of soiled equipment and waste. Wash linens (for example, bedding, caps, gowns, and surgical drapes) by hand or machine and line-dry or machine-dry. When handling soiled linens, wear gloves, hold linens away from your body, and do not shake them. Needle sticks or cuts cause most infections in health care settings.The average risk of HIV infection after a needle-stick exposure to HIV-infected blood is 3 infections per 1,000 needle sticks. The risk after exposure of the eye, nose, or mouth to HIV-infected blood is estimated to be about 1 infection per 1,000 exposures. Following universal precautions is the best way that providers can avoid workplace exposure to HIV and other fluid-borne infections. Post-exposure prophylaxis (PEP) with antiretroviral medicines will help to prevent HIV infection if a needle stick might have exposed a provider to HIV.